This Us marine Corps Flag and Certificate Display Case is available in either a solid oak display case or walnut flag display case. These marine Corps Flag and Certificate Display Cases are designed to beautifully display both a folded flag and other memorabilia in one convenient place. These solid oak and walnut USMC Flag and Certificate Display Case come with actual service uniform fabrics, not imitations, so you can rest assured that the fabric you receive in your case will be perfect for your branch of service. Even the wood is authentic – we do not stain our wood to create any type of appearance. What you see is what you get, in rich red oak or walnut, and we prefer to finish it with a clear coat to enhance the beautiful grain and preserve the natural color of the wood. For those who want to display more than just one flag, this wonderful marine Corps Flag and Certificate Display Case addition to a corner in your home or office is a keepsake for multiple purposes. The combinations of flag and other type of memento are virtually endless. Use this marine Corps Flag and Certificate Display Case as a military branch display case, a memorial flag display case, a burial flag display case or a Army flag as a Army flag display case. These solid oak or walnut cases are designed to beautifully display memorabilia in one place. We offer five different styles to suit most needs. The marine Corps Flag and Certificate Case is designed to sit on a shelf or mantle piece – it is 24 inches wide and just less than 21 inches high. 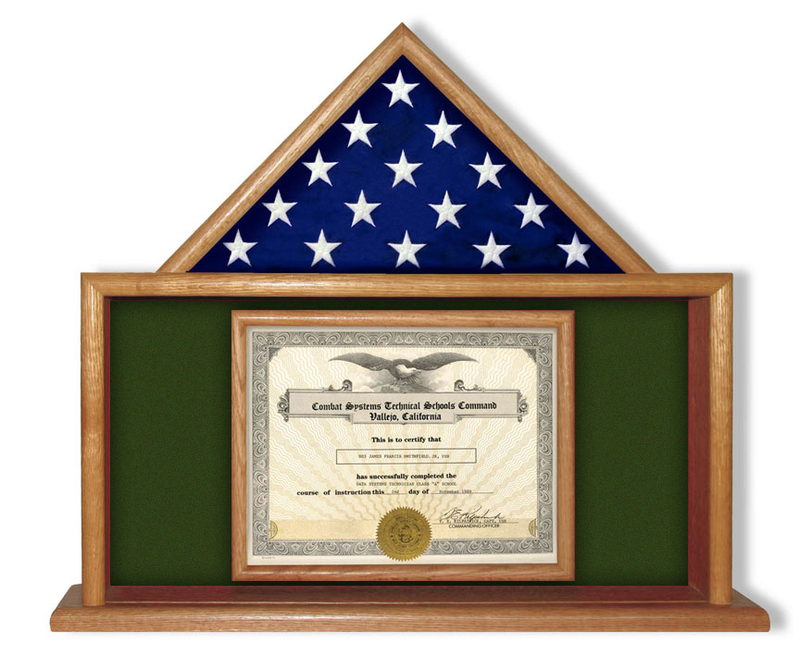 That Case marine Corps Flag and Certificate Display Case is available in Oak or Walnut. 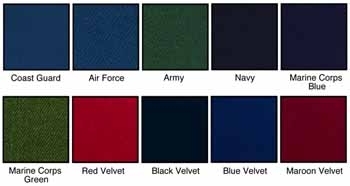 Orders for the marine Flag and Certificate Display Case are usually shipped out within one business day to places within the USA and Canada. I was happy you delivered the exact item I saw on the image of your site. The USMC Flag and Certificate Display Case is sturdy and a beautiful walnut finish. It had ample space for me to personalize a sentimental engraving for my husband. I feel honored that the same company that provided a case for Ronald Reagan is the same one that has furnished us a piece so honorable for my husband’s remains. I never anticipated this purchase; however, I am very pleased with the USMC Flag and Certificate Display Case for my sister’s husband. She had a tough time choosing but in the end, loved my selection. The flag and great seal do a wonderful job dignifying the final resting place of a fallen soldier. I browsed local stores as well as online for a flag case and am very satisfied with my purchase of the USMC Flag and Certificate Display Case . I love the construction and finish. Thank you once again for such an esteemed burial box for a cherished friend. I love how the US marine Corps Flag and Certificate Display Case constructed. It arrived in an excellent condition and I couldn’t be happier that my grandmother is being represented in such an honorable way. She was the wife of a veteran, who fought just as hard to keep her family together when he was at war. We love her and miss her, and are glad that she will be commemorated in a distinctive, proud way. Your marine corps Flag and Certificate Display Case represented our family well. I had no hassle in making the order and I received a very prompt delivery, well before my friend’s scheduled memorial service. Thanks for a beautiful box. This marine Corps Flag and Certificate Display Case is just the thing I was looking for to honor my late father. I had a classic cremation urn before, but felt that this solid wooden case was a bit more suitable with its flag overlay. He served for 20 years in the force and this was very appropriate. I wish I knew about these before. Nothing but the best for Dad.